Lucy Claire (w. Naomi McClean / cello) performing Sage, Joe Wilkes performing The Castle and Rita Braga performing Is There Another World? live in session on The deXter Bentley Hello GoodBye Show on Resonance 104.4 FM in Central London on Saturday 29th September 2018 (live sound engineers: Agathe Max + Martin Pearce). 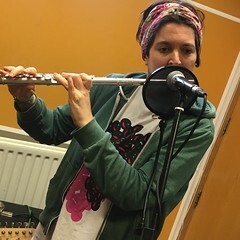 This entry was posted in dexter bentley, hello goodbye show, Live Radio on Film, resonance fm and tagged dexter bentley, hello goodbye show, joe wilkes, lucy claire, naomi mcclean, resonance fm, rita braga. Bookmark the permalink.